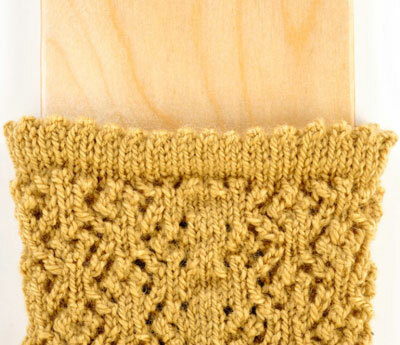 For these floral lace socks, you knit them toe up, using the Eastern Cast-On, a short-row heel, and a picot edging. Although only one size is given, the lace pattern is stretchy and accommodates a variety of sizes. 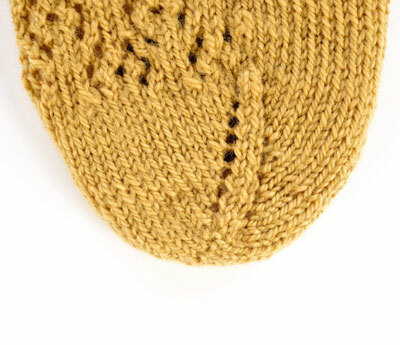 You can also adjust sizes by changing needle size (a larger needle produces a larger sock) or yarn thickness (sport weight yarn produces a larger sock). Knit the sts on the top needle, rotate, and knit the sts on the bottom needle to complete the CO.
Needle 1: Kfb, k to end of needle. Take up an empty needle. Needle 2: K to last st, kfb. Take up an empty needle. Needle 3: Kfb, k to end of needle. Take up an empty needle. Needle 4: K to last st, kfb. Needle 1: K1, yo, k to end of needle. Needle 2: K to last st, yo, k1. Rep rounds 3 and 4 until you have 15 sts on each needle. 60 sts total. Next round: K13, k2tog, k to end of round. 59 sts rem. The foot is where you begin working the lace pattern. Next Round: Work Floral Lace chart over next 29 sts, k 30 (see chart at right). 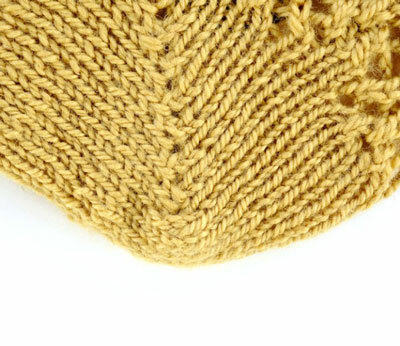 Work even in patt until foot measures 7.5 inches or 2 inches less than desired total foot length, ending at the end of Needle 2. Note the lace patt round on which you ended. Work the heel over 30 sts. Row 1 (RS): K 29 sts onto one needle. Wrap the next st and turn. Row 2 (WS): P 28 sts. Wrap the next st and turn. Now you pick up the wraps. 5Rep rows 3 and 4 until you have worked all wrapped sts. Do not wrap after you pick up the last double-wraps. Next Round: Work in Floral Lace patt over 29 sts, m1, k30. 60 sts. Next Round: Work 29 instep sts (front of leg) in established Floral Lace patt, k1, work 29 sts (back of leg) in same row of Floral Lace patt, k1. Work in patt on all sts, maintaining 1 knit st at each side and Floral Lace patt on front and back of leg until leg measures 6 inches from top of the heel. 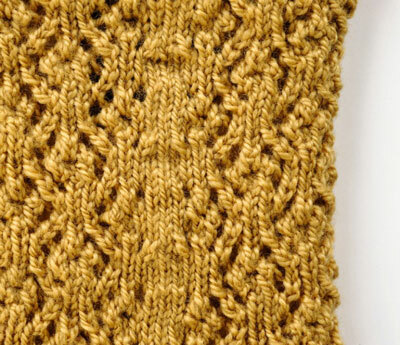 Knit the picot cuff and finish the sock. Work 6 rounds in St st (k all sts). Picot Round: * Yo, k2tog *, rep from * to * around. Work 5 more rounds in St st. Cut yarn, leaving a 24-inch tail. Fold picot edge along picot round into sock and sew live sts down to inside, maintaining an even tension.